During sediment capping, an artificial barrier is inserted between the sediment and the water (Figure 8). 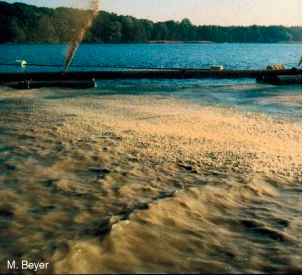 The barrier minimizes the transport of nutrients and other harmful substances from the sediment or the groundwater into the lake water. Another use of sediment capping is to prevent the growth of rooted macrophytes (see section titled 'Macrophyte biomass control'). Scientific background. The material for capping can prin cipally act as a physical or chemical barrier. The mechanical stabilization of the sediment surface decreases the transport of substances by resuspension, gas emission, or bioturbation. The efficiency of the barrier depends on its physical properties (specific density, porosity, settling behavior, and resuspension capability) as well as its chemi cal reactivity (stability, P binding capacity). Materials with sufficient physical properties are more efficient if they can additionally bind phosphorus in high quantities (active barrier systems). A physical capping should only be included in the management strategy when (1) the sediment has a high P mobilization potential and (2) the external loading has been decreased. Figure 8 Distribution of calcareous mud for sediment capping. fine grain materials such as fly ash, sand, clay minerals, and autochthonous calcite were used. Currently, natural and artificial calcites, zeolites, and clay minerals are being investigated. The specific weight of the capping material should not exceed 1.2-1.3 gcm to prevent its penetra tion into organic rich sediments. Chemicals can be used as a barrier when they are added in surplus (see section titled 'P inactivation'). In shallow lakes capping is ineffective due to resuspension and transportation of materials. Attempts at decreasing macrophytes have been carried out using polyethylene, fiberglass, and nylon sheets as a barrier. Phosphorus export can be increased by (1) hypolimnetic withdrawal, (2) external P elimination plants, or (3) sedi ment dredging.